Tank Details: My tank is a eclipse system six it's a Bio-wheel filter it is so easy to maintain,I am 12 years old and this is my first tank and I love it!! I would recomend this Aquarium to any one. 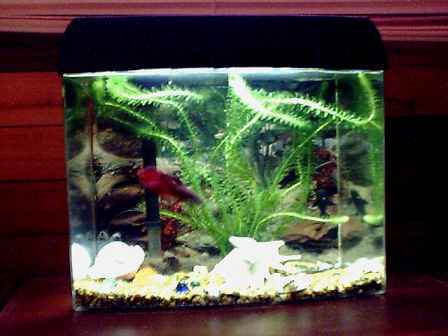 The Fish: I have 2 bristle-nosed catfish, 1 male siamese fighting fish, 1 mini shark, 3 glowlights (Red-lined Rasbora) and I am thinking of getting a couple more (webmaster's comment - The bristle noses may get up to 4", in that small aquarium, may do much better with Otos. Keep a close eye on the nitrates level there). Comments: I got my tank from America, the lighting is speical it helps my plants to grow (My plants are real) and brings out the best colours in my fish, My fish tank is six gallon small but I love it!